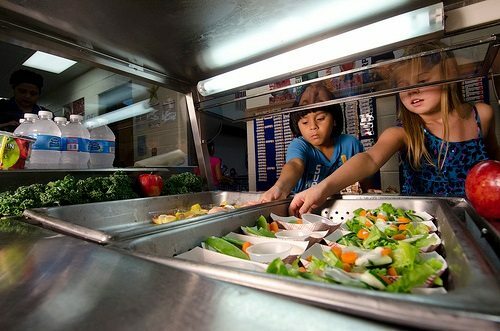 The U.S. school lunch program has been around for almost 70 years now, but some schools still struggle to get it right. That’s where Kenny “Lunch Angel” Thompson comes in. Last year, Thompson, a tutor and mentor at a Houston elementary school, helped pay the delinquent lunch accounts for over 60 elementary school children with almost $500 out of his own pocket. Children whose parents had not filled their lunch balances were consequently forced to eat alternative meals, often sandwiches of cold cheese slices or peanut butter and jelly, instead of hot lunches. Many of the students were already receiving reduced-cost lunches when they were placed on the alternate meal plans. Students would skip the lunch line to avoid the embarrassing and humiliating prospects of not being able to afford their meals. His good deed quickly went viral, and donations started pouring in from places as far away as Australia, Europe, and South America. With these contributions, Thompson created the nonprofit Feed the Future Forward specifically to help students pay for their school meals. From that one school district, Thompson’s work has expanded to nearly 141 schools and 150,000 students in seven school districts. After a year of work, these schools have either completely or significantly eliminated the number of students being given alternative meals. “Never in a million years in my wildest dreams did I think [we’d] be sitting here a year later and talking about what we’ve accomplished,” says Thompson. The problem, of course, doesn’t start and end in Houston. If a student’s lunch balance was unpaid at a school in Utah, the school simply threw the lunches away and gave the student milk and a piece of fruit instead. Indeed, the merit of school meals is hotly debated nationally, as can be seen from the Twitter campaign #ThanksMichelleObama (in reference to the First Lady’s strong push for healthier lunches) and the interesting comparisons between America’s school lunches and those of other countries. Perhaps as a result of the changing and more dominant role schools play in students’ lives, the onus has been placed on schools to ensure students are fed. And with stricter USDA guidelines for calories, sugar, and fat intake, schools must also seriously contend not just with serving food, but with what exactly they are to serve.